Now through August 6th, save 50% on 8×10 and 11×14 Prints through ROES and Remote Suite Plus Print Products. The dog days of summer are upon us and we’re kicking it off with big savings on our most popular portrait sizes. Available in all three photographic papers (E-Surface, Metallic and True Black & White), this is a great opportunity to offer a pop-up sale or update studio samples. Please Note: This sale only applies to orders placed through ROES and Remote Suite PLUS Print Products. Prints ordered via Proofing, Sports & Events, and School will not be discounted. Not valid for finishing services. The sale price will not be reflected in order summaries or email confirmations. The discount will appear once the order has been received by the lab. The minimum order charge will remain throughout the duration of the sale. Any order total that falls under the minimum charge will be rounded up to $15. 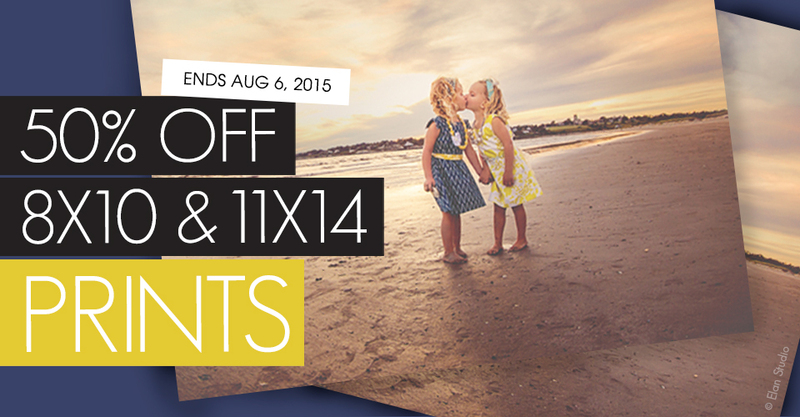 No code is necessary and offer expires August 6th at 11:59 p.m. (Central). Could you please extend this offer a few days to me? I changed email addresses and was not aware of this promotion until today. I would greatly appreciate it! Hi Marianne, unfortunately we are unable to extend the promotion for you due to constraints within our system. If you would like us to update your email, please contact custserv@millerslab.com!